What gave us the idea most Americans aren't car enthusiasts? 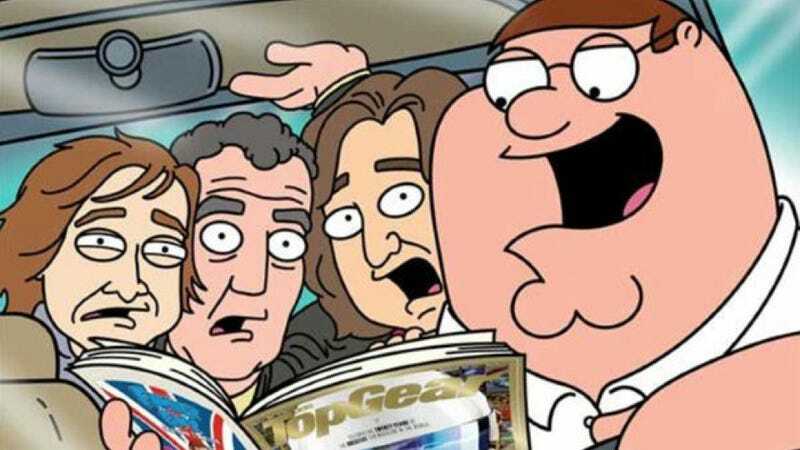 As you can see in the photo, this is Peter Griffin from Family Guy reading Top Gear magazine. This is the most clear proof ever that Jalopnik readers aren't a fringe of the population. Ignore the fact he's reading while driving, though. Oh, and that's Hamster, Jezza and Captain Slow terrified by Peter Griffin, too. Top Gear magazine decided to toot their own horn today, revealing that the Dec. 6 issue of the publication will feature an interview with Mr. Griffin, probably because he seems to be an average American to them and they probably aren't far off. The interview will reportedly have a series of automotive revelations that will, probably, be average. Now if only Clarkson could get Peter Griffin in the reasonably priced car. He'll have to face questions as to why the family dog drives a Toyota Prius. Oh, I'd also like to find out why.